The entire idea behind chiropractic is based on one simple fact: that your body is self-healing. The system that allows your body to heal is called the nervous system. It’s responsible for controlling and coordinating the behavior of every cell. When there is stress on your nervous system, your body can’t take care of itself like it was designed to. The bones of your spine won’t move as they should. Our job as chiropractors is to make sure your spine is aligned and freed up. When that occurs your body can be the efficient, self-regulating system it was meant to be. When your spine is aligned, the stress on your body is released. You then can be in a state of better overall health. Our first step is to give you a thorough evaluation to understand the cause of your health concerns. Once determined, we can create a plan to help you regain your well-being. As time passes, we can monitor your progress by evaluating you. To do that, we use state-of-the-art scanning technology, ensuring that you’re responding to care. We welcome all ages of people at our office with a particular emphasis on treating children and pregnant women. The kids who come to our practice often need help with issues such as ADHD, colic and injuries. Expecting moms see us because of concerns about breech presentations, aches and pains and pelvic problems. Our techniques include Gonstead, which is a specific system of analyzing the body’s structure and biomechanics, and Webster, which is for pregnant women. 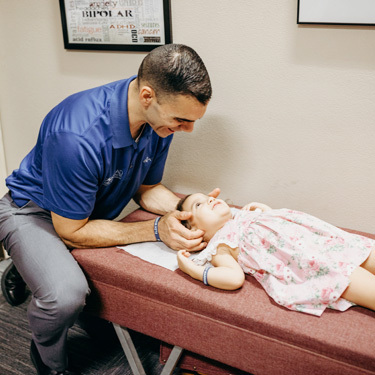 We’ll walk you through exactly what you can expect before we give you your first adjustment, getting your approval before starting. If you’re ready to learn more, contact us today to discuss the benefits of chiropractic!